The vLocPro2 (VLP2) utility locator receiver was designed to meet the tough requirements of the modern world. With more and more utilities being buried each day and also abandoned each day, it truly is a jungle beneath the ground. Today’s locator must not only trace the path of a buried utility, it must assure the user that the locate is beyond the shadow accurate. The vLocPro2 (VLP2) is the tool that will give you the same results time after time with speed and, accuracy which leaves you confident in the decision to put the paint mark on the ground. 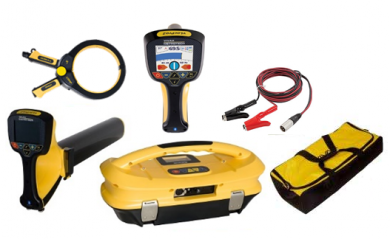 The vLocPro2 (VLP2) series locator is the locator of choice for the contract locating professionals. The vLocPro2 (VLP2) utility locator receiver has more than seventy active frequencies from 98Hz to 200kHz as well as several passive modes such as broad and narrow band power and VLF radio and SD (signal direction). Once the target line is located use the compass feature to quickly trace the line by following the compass line. Plug-in A-frame Fault Locator to find cable sheath and pipeline coating faults. Stethoscope Remote Antenna for positively identifying a line where many lines are together. 1 Watt Transmitter - The Loc-1Tx transmitter has one induction and three direct-connection frequencies ranging from 640Hz to 83kHz. This transmitter comes in a soft carry bag with connection leads and ground stake. 5 Watt Transmitter - The vLoc-5STx transmitter has broadband induction and multiple direct-connect frequencies ranging from 256Hz to 200kHz. Additional features of SD (Signal Direction), fault find and multi-frequency transmit modes are included. This transmitter comes in a soft carry bag with connection leads and ground stake. 10 Watt Transmitter - The Broadband Loc-10Tx Transmitter has multiple induction and direct-connection frequencies ranging from 98Hz to 200kHz. Additional features of SD (Signal Direction), fault find and multi-frequency transmit modes are included. This transmitter comes in a soft carry bag with connection leads and ground stake. Kit 1: The 1 Watt vLocPro2 Kit includes: vLoc Pro2 Receiver with bag, 1 Watt Transmitter with bag and alkaline batteries, connection leads, ground stake and manual. Configuration - 33kHz Induction & 640Hz, 8kHz, 33kHz Connection Modes. Kit 2: The 1 Watt vLocPro2 Kit includes: vLoc Pro2 Receiver with bag, 1 Watt Transmitter with bag and alkaline batteries, connection leads, ground stake and manual. Configuration - 33kHz Induction & 8kHz, 33kHz, 65kHz Connection Modes.